It can be very tempting to create a newsletter template using Microsoft Word. But it’s a temptation you should resist, if you want to get your email campaign a proper and effective layout. Here’s why: Word can add some non-standard coding to basic HTML, which will probably cause displaying issues once the your newsletter is open by the recipient (especially if she’s using a non-Microsoft client). Plus, the template creation itself is not as easy at it can seem at first glance — and this is for a very simple reason: Microsoft Word hasn’t been built primarily for that. Newsletter editing has very different needs than a text editing, and requires a very different kind of tool. Our newsletter builder is completely devoted to the process of template creation, with a basic goal: to make it as simple as possible. 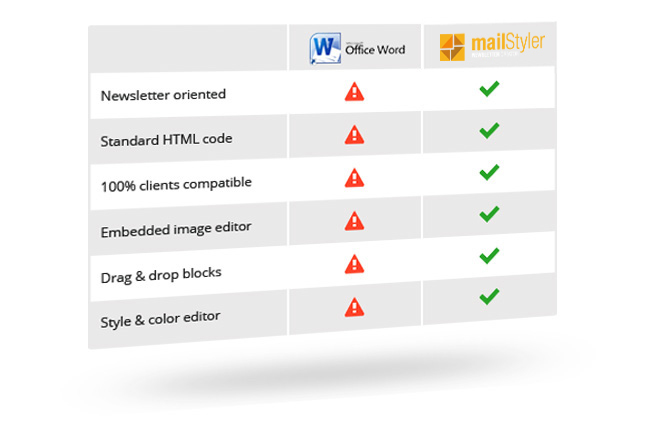 And as a matter of fact, with MailStyler you can create your own unique newsletter design completely from scratch, assembling ready-made blocks and layouts and personalize them with colors, font styles and other details. And most of all, the resulting HTML code will be absolutely flawless: 100% compatible with any mail clients. Which means that no matter where your recipients open your email, it will always look as you wish.